After I aged out of my near legendary days with the Runnin' Rebels of the RCBA, there were few options open to me as a basketball player. I was certainly FAR too awful to be able to play for my high school varsity team. They regularly competed for provincial championships. I had about as much chance of making that team as I did the Showtime Lakers. So, I did what any sensible kid with no discernible talent, but a desire to play does: I joined a private league that couldn't deny me a chance to play because I HAD PAID MY MONEY! I don't even remember the name for my Regina South Zone Youth Basketball Association team, but I'll always remember being dwarfed by player/coach Daryl. What an intimidating, hairy behemoth of a man child. In high school, he had more hair on his face than the floor of my barber shop sees in a week. I showed up, I practiced, I played, and like my RCBA days, I just tried to have some fun and not get in the way. I didn't play a ton, I got the ball even less, but I had a good time. This stands in stark contrast to the other basketball experience I had around the same time. Every year, my church would host an inter-church youth group basketball tournament. Little did I know that my experience as a bench warmer in other leagues was preparing me to DOMINATE inexperienced freshman one Saturday afternoon a year. The difference in my success between the RSZYBA and the church tournament was my usage. I didn't even try to dribble in RSZYBA. My ham fisted attempts to not bounce the ball off my own feet were embarrassing. If I tried to drive the lane, the ball would be picked off before my teammates could even groan at the turnover. Against these other kids though, man, I had handles like the door hardware aisle in Lowe's. I could go anywhere on the court I wanted, and got bolder and bolder. For all the self-effacing stuff I say about my game as a kid, in fairness, I had a decent uncontested jump shot: Metta World Peace good. Nothing to write home about, but when it was working, it was working. I rarely got a chance to use it under the tutelage of Daryl, but in that church gym I was dropping dimes like Steph Curry facing grade school kids. I could make everything I had a look at and was getting the “SHOOTER” shouts every time I got the ball in my hands. My awkward young ego BLOOMED. What was the difference? Usage. In the RSZYBA I was a poor player among skilled kids who were going somewhere. Against tough competition, it didn't matter how much playing time I got because I was dreadfully overmatched. In that small gym against a bunch of non-athletic church kids, just there for the pizza a Pepsi afterwards, I could DOMINATE! I got to play against inferior defenders and the players on my own team were more likely to give me the ball to shoot. I was the core of the offensive game plan. I knew exactly how to play those plywood backboards and use the lack of space to my advantage. Being the used made all the difference. Last week I shared some of what I've been learning about playing time and how minutes pretty much directly correlate with production. If you don't play, you can't score. A lot of value plays see significant upticks in minutes that make them productive. One of the big mitigating factors though is usage. When a guy in a bench role gets playing time on a given night, it's often alongside other bench players and against the other teams reserves as well. He gets to feel like the private league player who gets to dominate the church kids. He's playing with and against players of a similar level and as such his usage rate in the offense is high. But, if he gets pushed into the starting lineup, all of a sudden the level of competition goes up, and the stars demand the ball. More playing time doesn't necessarily directly correlate with similar production as usage rates can go down when a player receives more time with the starters. What do I mean by usage rate? Truth is, I had no idea up until a couple days ago. 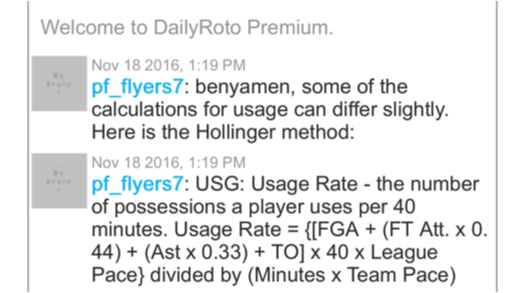 The folks in the NBA premium chat here on DailyRoto are a great help. It's a great place to share ideas and get some direction from those who have some semblance of an idea of what they're doing. Special thanks to premium chat member pf_flyers7 for the education. Prior to this I figured “usage” must just simply be the percentage of a team's shots a guy is responsible for while he's on the floor. It's a little more complicated than that apparently. My conception of usage was like justifying a Cy Young based on Wins. This is more like trying to calculate xFIP or SIERA. It's something you let the computers handle rather than trying to do the math on your fingers. There's a lot more that goes into calculating usage than just shots versus playing time. As I experienced, increased playing time doesn't necessarily correlate with increased scoring, in part because of usage. When a player is facing a different level of competition on defence, or gets a different role in his offence because of touches going to other players, their usage will likely go down. Take for example the Indiana Pacers of the past week. With injuries to Paul George and other regular contributors, they were forced to give extended playing time to some reserves. The increased playing time didn't necessarily translate into more production though, especially for guys like Glenn Robinson III as he logged a team high 37 minutes but only put up a stat line of 8-5-1. Minutes don't translate to value if the usage rate isn't consistent in a different situation. He was getting used on the court, but not in the offense. While you're doing your research, look for value plays with increased minutes, but remember their adjusted role in their offense, as their supporting stats like usage and efficiency (that's next week) may not carry over to their starting role. There is more to finding value plays than just increases in playing time. It was a bit of a down week for me. I really got burned counting on reserve players getting increased minutes for value picks from the Mavericks, Pacers, and Suns. Maybe I had a little too much reliance on sub 4k value picks to try to get studs in cash game lineups, but overall I think my process was okay. I ended the week with an exciting night with a top 50 finish in a $1 entry GPP that salvaged my feelings of competency. Hopefully I can continue to refine a process and figure out what stats and such to research, along with looking at the podcast notes and projections to create lineups. Good luck to you as we walk this NBA path together and Happy Thanksgiving Weekend!